As you know, the SPG provides guidance on the implementation of London Plan policy 5.3-Sutainable Design and Construction, as well as a range of policies, primarily in Chapters 5 and 7 that deal with matters relating to environmental sustainability. ‘Air quality neutral’ (AQN) is one of 13 policy areas addressed by the draft guidance. While this SPG would not have formal development plan status, after its consultation period and if it were formally adopted by you as supplementary planning guidance under your powers under the Greater London Authority Act 1999 (as amended) it would be a material consideration in drawing up local and neighbourhood plans and in taking planning decisions. c. be at least ‘air quality neutral’ and not lead to further deterioration of existing poor air quality (such as areas designated at ‘Air Quality Management Areas (AQMAs). This policy is supported by an unambiguous earlier commitment in the Mayor’s Air Quality Strategy (MAQS) to ‘ensure that no new development has a negative impact on air quality in London’. CAL was concerned when you subsequently and belatedly sought to define ‘Air quality neutral’ in the Glossary of the London Plan as ‘Best available techniques to be applied to minimise pollutant emissions’. Further, CAL had seen no evidence that you had consulted on the Glossary definition of ‘Air quality neutral’ before publishing it alongside the London Plan. CAL therefore asked you to delete the definition because it was inaccurate and inconsistent with the statutory London Plan. As you know, a development which merely seeks to ‘minimise’ its emissions may very well still contribute to an overall increase in air pollution – which is clearly at odds with the commitment in the MAQS. Given that many parts of London continue to exceed statutory limit values by a factor or two or more, leading to serious and well-documented adverse effects on public health, the MAQS commitment should itself be regarded as a minimum. It is vital, therefore, that the meaning of AQN, which is perfectly clear, is not undermined through flexibility of interpretation. CAL welcomes therefore your confirmation on 11 October 2013 that the definition of ‘Air quality neutral’ has been deleted from the ‘Glossary’ to the London Plan. It remains vital that the meaning of AQN, which is perfectly clear, is not undermined through flexibility of interpretation. Having produced a (largely) good Air quality Policy 7.14 in the London Plan and deleted the wrong definition of AQN, CAL is gravely concerned you are proposing to take backward steps in the proposed guidance on AQN in the Sustainable Design and Construction SPG. The guidance is fundamentally flawed and appears to be re-introducing the approach deleted this month from the Glossary of the London Plan i.e. a focus on emissions not concentrations. Further, the proposed new guidance is based around emissions of oxides of nitrogen (NOx) instead of nitrogen dioxide (NO2). Given that nitrogen monoxide (NO) is not harmful or subject to WHO guidelines or legal limits, you are again weakening the link between emissions from developments and air pollution. In particular, with NO2 emissions rising as a percentage of NOx in recent years, the AQN guidance will continue to get further out of touch with reality. Your new guidance on AQN seems designed to create a raft of loopholes for developers and others rather than protect Londoners and drive positive change. Please scrap the guidance and re-write it based on concentrations. The AQN guidance excludes many important forms of development. For example, ‘housing’ is not mentioned with schools, hospitals, care homes and nurseries despite it being included very specifically in the London Plan. The AQN guidance is at odds with the London Plan requirements for AQN which apply to all developments. For example, the Draft SPG says “Air quality assessments are required for major developments where…” Paragraph 4.3.4 on page 105. It also defines ‘exceedances’ as a ‘period of time’ when they are nothing of the sort (note 65). for all other uses, where the floor space is 1,000 sq m or more (or the site area is 1 ha or more). It seems commercial and domestic buildings are excluded. See paragraphs 4.3.14 and 4.3.21. 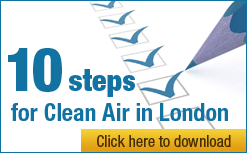 Further the report titled ‘Air Quality Neutral Planning Support: GLA 80371’ suggests it would be inappropriate to apply the AQN policy to industrial installations that fall under Environmental Permitting Regulations and major transport infrastructure development, such as that proposed by Transport for London, which is assessed using the Transport Advisory Guidance (TAG) methodology. As you know the TAG guidance proved inadequate when used to assess the removal of the M4 bus lane. Amazingly, the guidance would exclude you from the obligations in your own London Plan and other developments. Please ensure the guidance covers all developments. For the reasons stated above the AQN guidance should be based on concentrations not emissions. If emissions are included in any way at all in AQN guidance they should be based on the most up-to-date emission factors and real world data. You published the Draft SPG on 30 July, nearly three weeks after the publication of the London Atmospheric Emissions Inventory (LAEI) 2010 on 10 July 2013. There was plenty of time to update the Draft SPG to include LAEI 2010 data which you also published. Why were the benchmarks and standards not updated therefore as recommended by your own consultants who stated ‘As the benchmarks are founded on a variety of input assumptions, they will need to be reviewed and updated on a regular basis, ideally to coincide with updated versions of the LAEI’? See paragraph 3.1 of their report. By using low emissions estimates, based on the LAEI 2008, to define benchmarks and standards you are setting hopelessly lax targets for developments. Please use LAEI 2010 data for any emissions estimates updated as below. CAL estimates these show real world NOx and NO2 emissions from road transport to be some 10% to 30% higher than those your included in the LAEI 2010 which were 15% higher than those included in LAEI 2008. Please use LAEI 2010 data for any emissions estimates updated for the latest real world emissions factors based on the research by Carslaw at al. Given the above, it is particularly troubling that you are proposing emissions benchmarks and standards based on hopelessly out-of-date emissions inventories. Worse, you propose then to give developers carte blanche by saying: ‘Developments that do not exceed these benchmarks will be considered to avoid any increase in NOx and PM emissions across London as a whole and therefore [be] ‘air quality neutral’. they are based on the LAEI 2010 updated for the real world emissions results produced by Carslaw et al. It would be totally unacceptable to launch this guidance based on the out-of-date LAEI 2008.
they are technology neutral rather than a series of laxer standards for more polluting technologies i.e. specify a single lowest emission standard for all boilers and CHP plant that is based on the ‘best available technique’ i.e. ultra-low NOx gas plant. Otherwise, we are likely to see a proliferation across London of the cheapest most polluting technologies e.g. diesel, biodiesel or solid biomass boilers and/or CHP plant. any benchmarks and/or standards used must be updated, not just reviewed, at least annually to ensure they achieve at least ‘air quality neutrality’ and improve air quality. CAL is concerned you are making it easy for developers to include diesel, solid biomass or other biofuel CHP plant or boilers within Greater London. CAL has long said that there should be no additional emission sources in London until legal limits are met and certainly no biomass burning on any site within the gas grid. Diesel exhaust, particulate matter and outdoor air pollution have all been classified as carcinogenic to humans by the World Health Organisation. CAL has heard that total NOx emissions from CHP and/or boilers in one or more London boroughs may soon equal the total such emissions for road transport in that borough. If confirmed, this would be deeply troubling. CAL notes that the consultation on the ‘Control of dust and emissions during construction and demolition SPG’ was only launched on 2 September i.e. more than a month after the consultation on AQN. This has given no time to consider it properly. Please wait therefore for comments on that guidance before finalising your response to this consultation on AQN. off-setting ever-increasing emissions can never be a sustainable strategy since sooner or later the off-set mechanism runs out of capacity to address the problem. A similar example would be to rely on tree planting to offset carbon emissions. even onsite off-setting means that people are exposed inevitably to harmful emissions between the source of emissions and the off-set mechanism e.g. between tail pipes and a greenwall or green infrastructure. off-setting offsite is even worse as it raises the most serious issues of inequity and environmental justice. Imagine, for example, a new housing development for the poor which fails to mitigate air pollution on site and is allowed to improve air quality in a rich area some distance away. The only sustainable strategy is to reduce and mitigate fully emissions at their source. Greenwalls may look beautiful. However, even the guidance acknowledges they have a ‘small but beneficial effect’. Paragraph 4.3.8. CAL understands that ENDS estimated, based on the Mayor’s own ‘Clean Air Fund – End of Programme Report’ in January 2013, that greenwalls cost over 40 times (£/kg) as much as measures to reduce emissions directly at source e.g. retro-fitting vehicles. CAL welcomes your recommendation that developers adhere to EN 13779:2007 to ensure that air filters are fitted and regularly maintained. However, the AQN guidance wrongly limits this recommendation to areas of ‘poor air quality’ whereas this British and European standard applies to all locations. Please amend the guidance accordingly. Directive 2008/50/EC on ambient air quality and cleaner air for Europe imposes strict limits for the protection of public health and the environment. Please ensure that the AQN guidance is consistent with that Directive and explicitly mentions it. making no firm commitment to update the guidance at least annually for actual real world emissions and concentrations (as opposed to when there are ‘technological and commercial advances’). In essence, CAL considers you are seeking through the new guidance for AQN to reintroduce the flawed definition of AQN that has just been deleted from the London Plan. Worse, by actively encouraging the use of biomass burning and diesel use in London you are taking London back 60 years or more. That is totally unacceptable. Please scrap therefore the current proposals and address fully the above concerns. If you do not, you will only be able to reduce carcinogenic air pollution and comply with limit values by introducing draconian transport measures.